Her life before: Owner stated with the kids (ages 4-16) she was playful and affectionate.Honey would follow the four year old around the home and lick and give the child kisses, they would play together and Honey was tolerant of the rough play from the child. Honey does not mind if a treat or toy is taken away, owners stated the children would sit by her while she ate her bones and place their hands near her. Honey was taken to the groomers and was said to have great behavior. Owner stated Honey lived in a multifamily home an interacted daily with the tenants of the building. She is described as shy around strangers and takes a few minutes to warm up. After she is comfortable she will engage in exuberant play with the adults and children. Honey was taken to the dog park for interactions and owner stated she would sniff the other dogs and was respectful, she would not engage in play. Honey has not been around cats. 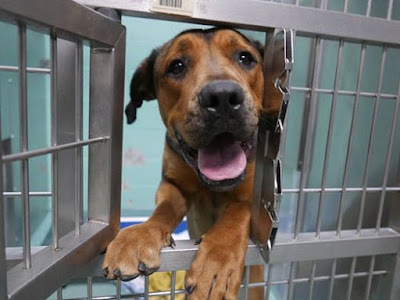 HONEY, A1102514, BROOKLYN CC Please call (212) 788-4000 with that ID for automated instructions. Additionally, please share this story of HONEY on Facebook or Twitter, so we are closer to finding him the forever family he rightfully deserves. We have done it before and can certainly do it again. 1 Response to "She Used To Follow The 4 Year Old Around And Give Her Kisses - Today She Terrified Waits To Die ... "